Siquijor island is often overlooked by tourists traveling to the Philippines. The island is known for its witches, shamans, and magic potions but you don't need to believe in magic to be enchanted by the island's beauty. With turquoise waters, hidden waterfalls, and quiet beaches, there is so much to do on this tiny island. We knew very little about Siquijor before we visited, but it ended up being one of our favorite islands in our 6 weeks in the Philippines. This guide will help you navigate this adventurous island. Siquijor is really small: you could easily drive from one end to the other in less than an hour and a half. While you could rush through all of these sights in a day, we stayed for 4 days and still wished we had more time. 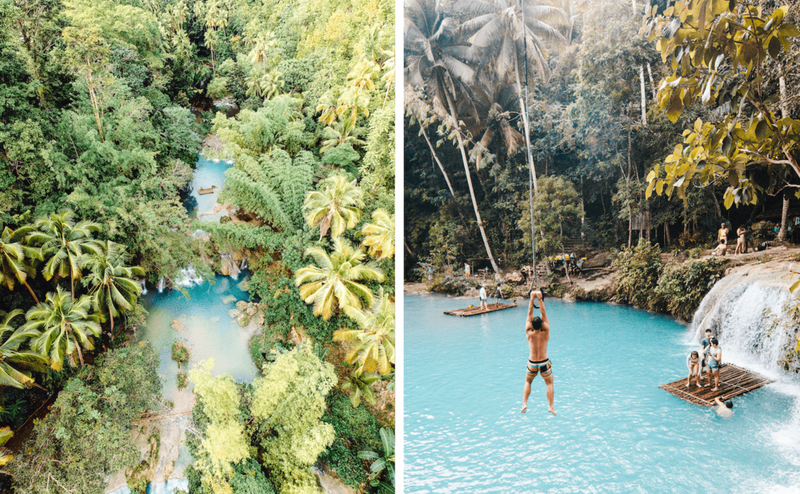 Here are all the main attractions on Siquijor plus one unexpected gem we discovered. The main attractions of this beach are two 7-meter and 10-meter cliff jumps, both off of concrete platforms. Unfortunately, our experience here was not the best. We got here at low tide and the water was way too shallow so the jumps were closed. We then decided to fly our drone which was only at 30% battery. After a short 5 minutes of flight, the drone entered critically low battery mode and ended up clipping the edge of one of the diving boards and falling into the ocean below. Goodbye drone! Anywho, if you come here at high tide, love cliff jumping and don't crash your drone I'm sure you'd have a good experience here! Entry is 30 PHP and scooter parking is 20 PHP. This impressive baby-blue waterfall was by far the most touristy spot in Siquijor. When we arrived, we were intercepted by someone who insisted that we would need a guide. If this happens to you, politely decline! The "hike" down is an easy 10-minute walk down concrete steps so you really don't need a guide. Entry to the falls is free, but as our guide awkwardly reminded us every few minutes, you're expected to tip your guide. At the waterfall, there are two Tarzan swings which each cost 50 PHP per person for unlimited swings. We had so much fun doing flips, or in my case, flailing, off the swings. If you decide to go here, just come early to beat the crowds! This ancient Balete tree is one of the oldest and biggest on Siquijor island and is thought to be enchanted. A spring flows from the base of the tree straight into a man-made pool which has been turned into a fish spa. If you haven't been to a fish spa before, you stick your feet into a pool of fish that love to munch on dead skin. It's not painful at all but if you're extremely ticklish like me it's a mellow form of torture for sure. Sometimes you can also find one of the local witches selling love potions and other spells here. Entry is 10 PHP and scooter parking is 5 PHP. This waterfall is much quieter and more peaceful than Cambugahay falls. But if that sounds boring to you, it also has one of the highest Tarzan swings in the Philippines. You swing across the base of the waterfall, let go at the right time (hopefully), then drop 8 meters. I've done plenty of 8+ meter cliff jumps before and this swing was 100 times scarier. Entry is free but you need a guide to show you where and how to jump and tipping is expected. If you're looking for the best sunset on Siquijor island and maybe even the Philippines, Paliton Beach is the place to go. Unfortunately, many other tourists have the same idea so you're unlikely to have the beach to yourself. However, if you wander up and down the coast, there are plenty of other west-facing beaches with the same sunset view. We ended up at the beach behind Coral Cay, where there were palm tree swings and nobody else in sight. This is a must-do for all the turtle lovers out there. If it's your dream to swim with turtles, this might be the best place in the world to go (or at least the place with the highest probability of seeing a turtle). Normally when going on any wildlife-spotting journey, the staff will tell you something like "We can't control nature, there's no guarantee that we will see anything, etc." But when we arrived on Apo island, we were told that there was a 99.9999% chance that we would see a turtle. We ended up seeing more than 20. Right now, due to a recent change in the type of boats allowed at Apo Island, the only way to visit from Siquijor is by going on a day trip with Coco Grove Beach Resort. You have the option to snorkel, dive or do both. We chose to snorkel in the morning (since we were told that's when you see the most turtles) then did one dive in the afternoon. It definitely was crowded at times while snorkeling but the number of turtles we saw made it more than worth it. Diving was more peaceful as there were only 5 people but we only saw a few turtles then. Overall, this was an unforgettable experience and ended up being one of our favorite experiences in the Philippines! As promised, here is the random gem we discovered. Marelle's is both a restaurant and museum and if you eat at the restaurant you can get into the museum for free. We didn't really know what to expect of this place but a guy we met really raved about this place so we decided to check it out. First of all, the food here is amazing! The clam chowder very well might be the best clam chowder in all of Asia based on my limited experience with clam chowder in Asia. Everything we ordered was so delicious and reasonably priced. While we were waiting for our food to come out, the owner gave us a tour of the thousands of seashells in the museum. We saw shells worth hundreds of dollars, extremely poisonous shells, giant shells, and other preserved marine life. The owner was so incredibly nice and knowledgable and answered all of our underwater questions! If you're a diver, snorkeler, or beach lover, you'll never look at shells the same way after this visit. Siquijor Island is located in the Visayas in the Philippines. Siquijor doesn't have its own airport so the best way to get there is by taking a ferry from Cebu or Dumaguete. There are two ferries per day with Maayo Shipping which leave from Liloan in south Cebu and go directly to Siquijor. Otherwise, there are numerous ferries going between Cebu and Dumaguete and Dumaguete and Siquijor every day. Check here for the ferry schedules. For the lowest chance of rain and the best weather, visit Siquijor between February and May. December through February is the high season so prices will be higher and attractions will be busier. Otherwise, June through August is a good time if you don't mind rain and want fewer crowds and cheaper prices. Glamping Siquijor by the Beach - The name pretty much says it all. These beautiful tents will make all your hipster, beach glamping dreams come true. Don't forget to make it home in time for those striking sunsets. Coco Grove Beach Resort - Gorgeous, spacious cottages, and a swim-up bar! This is a very popular resort so book ahead of time. AMK Travelers Hub - Super clean and private rooms for budget conscious travelers. Marelle's - The best seafood we had in the Philippines plus the crazy seashell collection I raved about above. Baha Bar - They serve all of the Filipino classics. We went back for their 2-person Pork Sisig numerous times.